Several U.S. states or regions, as well as at least one Canadian province, have adopted, or considered adopting, some form of regulation to promote the use of transportation fuels having more favorable carbon intensity (i.e., reduced greenhouse gas emissions) than fuels currently in use. These are typically called “Low Carbon Fuel Standards” (LCFS), and they differ in several ways from the provisions of the U.S. Renewable Fuel Standard, described in previous blog entries, most notably in applying to all transportation fuels, not only biofuels, and also in that they don’t rely on tiered categories of fuels, but instead each fuel is assigned a regulatory and economic value based on its carbon intensity, calculated through life cycle analysis. In this blog entry, I’ll describe the LCFS law currently being implemented in California. In a subsequent blog post I’ll write about LCFS laws on the books or proposed in other states or regions, as well as a proposal to establish a national LCFS that would replace or modify the existing RFS. The State of California maintains Low Carbon Fuel Standard (LCFS) regulations as of a result of a sweeping climate change initiative known as Assembly Bill 32 (“AB32”) adopted in 2006, that set an absolute statewide limit on greenhouse gas emissions. The LCFS regulations took effect in January 2010, and can be found at 17 CCR §§ 95480-95490.Under these regulations, fuel providers (i.e., sellers of fuel) are required to reduce the carbon intensity of the fuels they sell, with the goal of achieving a 10% reduction in carbon intensity by 2020 relative to the “baseline” level of 2010 carbon intensity. When used in the context of regulations such as the LCFS, “carbon intensity” is defined as the net mass of carbon dioxide gas (or its equivalent) that is released over the life cycle of the fuel, taking into account the energy and materials needed to produce the fuel. Carbon intensity is usually measured in units such as grams of carbon equivalent per megajoule of energy. In regulations such as the LCFS, carbon intensity of a renewable fuel is usually measured against a baseline, i.e. the carbon intensity of the fuel it is meant to replace. Fuel providers must determine and report to the California Air Resources Board (CARB) the carbon intensity of all the fuels they provide, with the carbon intensity of some fuels found in a “lookup” table based on life cycle analyses conducted by the staff (Tables 6 and 7 in §95486(b)(1) of the regulations), and the carbon intensity for other fuels established through a petition process that is described below. Because of the size of the market in California, these regulations are expected to create a significant incentive for the use of renewable fuels with favorable carbon footprints that will have an impact on national markets. The LCFS regulations require regulated fuel providers to submit quarterly reports to CARB summarizing the carbon intensities of the fuels they sell, in reference to the yearly standard for GHG reduction relative to the 2010 baseline. Providers can meet each year’s standard by providing fuels whose total carbon intensity is lower than the standard, and/or by using purchased or banked LCFS credits. LCFS credits are created when a regulated party overcomplies with the carbon standard in any given year, and credits can be traded between regulated parties (but not between regulated parties and entities that are not regulated parties). The market for LCFS credits has just recently begun to emerge, as is discussed below. The first set of fuel carbon intensities in the lookup table were developed by CARB staff, but it is the responsibility of fuel providers to establish and obtain certification for the carbon intensities of fuels not found in the lookup table. Regulated parties may use one of two methods to determine the carbon intensities they report under the LCFS. Under Method 1, a regulated party can select carbon intensity values from the fuel carbon intensity lookup table as described above, if its pathway reasonably matches a pathway found in the look-up table. Under Method 2 (which features two alternatives, 2A and 2B), any person or group, whether a regulated party or not, may seek Board or Executive Officer approval of additional fuel pathways or subpathways. If a proposed pathway or subpathway is approved, it is added to the lookup table, and becomes available to all regulated parties. The LCFS regulations and other information on the CARB website provide reasonably good guidance as to how to submit a Method 2A or 2B application to have a new renewable fuel accepted under the LCFS program. These applications require that a life cycle analysis (LCA) must be performed for each fuel pathway using the California-approved CA-GREET model. During their review of the petition, CARB staff will use the GTAP model to assess whether the pathway involves land use change or other indirect effects. Such indirect effects include the impact of displacing land or resources for fuel manufacture that would otherwise be used for different purposes. Consideration of land use change, particularly indirect land use changes, is often controversial within the biofuels industry, but such a review is required under the California LCFS regulations. Significant data must be submitted along with each Method 2A or 2B application. This includes a detailed description of the manufacturing process for the fuel and the data from which the LCA was derived, along with the results of the LCA itself. Applications must include operating data from a production facility, to substantiate the mass and energy balances that formed the basis of the LCA. For a proposed application to be approved by the Executive Officer, the regulated party must demonstrate that the method is “scientifically defensible”, which is defined in the regulations to mean that the method has been demonstrated to the Executive Officer as being at least as valid and robust as Method 1 for calculating the fuel’s carbon intensity. To state it a little differently, the guidance document says “that a new pathway is deemed to be scientifically defensible if the carbon intensity value it yields is at least as robust as the values currently in the lookup table.” Proof that a proposed method is “scientifically defensible” may rely on, but is not limited to, publication of the proposed Method 2B data in a major, well-established and peer-reviewed scientific journal. CARB’s guidance documents strongly suggest that applicants consult with CARB staff before submitting an application. The California LCFS standards potentially provide an important market driver in view of the size of the California market. However, the future of this regulation is somewhat in doubt. On December 29, 2011, enforcement of the LCFS was temporarily halted by a court order as a result of a lawsuit maintaining that the standards imposed unconstitutional constraints on interstate commerce. This claim arises because one result of the CA-GREET LCA analysis is to consider corn ethanol manufactured in the U.S. Midwest to have a less favorable carbon intensity than fuels manufactured elsewhere in the country, and the lawsuit’s proponents allege that this creates a constraint on commerce between California and other states that violates the U.S. Constitution. In the wake of the court order, CARB continued to administer some aspects of the program, particularly petitions for new fuel pathways, and on April 23, 2012, the injunction was lifted by the Ninth Circuit U.S. Court of Appeals, so that CARB can continue to implement and enforce the entire LCFS pending the outcome of the trial on the lawsuit. On October 16, 2012, a three-justice panel of the 9th Circuit U.S Court of Appeals heard arguments on the constitutionality of the California LCFS, with arguments focusing on whether the law unfairly discriminates against out-of-state fuel producers by factoring fuel transportation and other considerations into the required life cycle analysis of carbon intensity. No timetable has been set for the Court’s ruling. It is hard to speculate on the possible outcome of this lawsuit, but my personal opinion is that the State might be able to prevail if it can demonstrate that the treatment of out-of-state fuel production facilities was based on a reasonable and tangible scientific rationale, rather than a policy which could be seen as just an arbitrary penalty for operating out of state. Inasmuch as there is such a scientific basis, the State might well have a good chance of prevailing. Failing that, the State might lose the lawsuit, which would likely mean that the regulations would have to be amended in a way that avoids creating any implication that out-of-state fuel production was treated differently than in-state production, for example by possibly removing any consideration of the energy costs of transporting fuel to California from its originating plant. CARB issued a quarterly data summary on November 1, 2012, showing that about 310,000 metric tons (MT) of credits and about 240,000 MT of deficits were generated under the LCFS in the 2nd quarter of 2012. Ethanol accounted for about 80% of the credits, with most of that amount attributed to corn ethanol having carbon intensities above 80 gCO2/MJ. The November 2012 data summary also reported that there were nine trades of LCFS credits in the first half of 2012, and that the credit price in these trades (actually 6 of the trades where prices were reported) was in the range of US $10-30 per metric ton. These are the first public trades of LCFS credits, and so this begins to establish the economic value of these credits. A group of oil companies and fuel providers, at a private meeting in January 2013, decided to take steps to oppose the LCFS regulations. The meeting was convened by a trade group Fueling California, whose membership includes fuel producers and large fuel consumers. Opposition to the LCFS reportedly arose from concern that there would not be sufficient low-carbon fuels available in the market to meet the law’s targets through 2020. No specific actions were reported, and meeting attendees apparently also discussed concerns about other state programs such as its cap-and-trade program to control industrial air emissions. Several previous entries in this blog from 2010 (beginning here), described U.S. Environmental Protection Agency (EPA) regulations under the Toxic Substances Control Act (TSCA) that may cover the use of certain genetically modified microorganisms in biofuel or bio-based chemical production. These regulations specify that some genetically engineered microorganisms intended for use in biofuel production (e.g., as production organisms for biofuel-processing enzymes, or as organisms directly used in the fermentation of biomass to fuel) require notification to EPA prior to commercial use, through the filing of Microbial Commercial Activity Notices (MCANs). In this blog entry, I’ll describe two significant developments under the EPA TSCA biotechnology regulations, both of which have implications for the biofuels industry – one is a proposed expansion of the list of “recipient microorganisms” that are potentially eligible for the tiered exemptions under the rules; and the other is the first use of EPA’s “significant new use” regulations to limit approved uses of a new microorganism covered by an MCAN. As described in my earlier blog entries, there are several exemptions from MCAN reporting that are available under the regulations. One category of exemptions are the tiered exemptions that are potentially available for intergeneric microorganisms that might otherwise require MCAN reporting, where well-characterized genetic changes are made to one of several starting organisms (referred to in the regulations as the “recipient organism”). These exemptions were described in detail in one of my 2010 blog posts, and the list of eligible recipient organisms was included in another 2010 post. To briefly summarize the situation, the TSCA biotechnology rule created Tier I and Tier II exemptions for specific intergeneric microorganisms meeting certain criteria. First, the host (“recipient”) organism must be one that is included on the list found in Section 725.420 of the regulations. This list includes many well-studied species including E. coli K12, Saccharomyces cerevisiae, Bacillus subtilis, and others. Second, the introduced genetic material in the microorganism must be well characterized; must be limited in size to the minimal genetic information needed; must be poorly mobilizable; and must be known to be free of harmful sequences. Third, the regulations specify specific containment and control procedures to minimize the possibility that the engineered microorganism might inadvertently be released. If the applicant can use an intergeneric strain qualifying for the exemption in strict compliance with these procedures, the process is eligible for a “Tier I” exemption and can be used commercially with no prior EPA review or approval, and merely upon 10 days advance notice to EPA. If the applicant intends to use such a microorganism under conditions less strict than these procedures, the applicant can submit a petition for a “Tier II” exemption 45 days before intended manufacture. EPA would approve the Tier II request if it felt that the proposed containment and control procedures, although not identical to the specified procedures, were sufficient for the organism in question. On September 5, 2012, EPA published a notice in the Federal Register announcing the promulgation of a Proposed Rule that would add two microbial species to the list of recipient organisms potentially eligible for the tiered exemptions. These are Trichoderma reesei and Bacillus amyloliquefaciens. These are both well-studied species that have historically been used quite frequently in industrial fermentations – many previously-filed MCANs covering microorganisms used to produce biofuel-processing enzymes have involved modified strains of T. reesei, while B. amyloliquefaciens has been frequently used as the host organism for production of industrial enzymes in foods, brewing, and other industries. The original biotechnology rule provided a process by which interested parties could file petitions proposing that additional microorganisms be added to the list of species eligible for the tiered exemptions. Using this procedure, Genencor International, Inc. (subsequently supported by the Enzyme Technical Association) and Novozymes North America, Inc., submitted letters of application to EPA requesting that Trichoderma reesei and Bacillus amyloliquefaciens be added as candidate recipient microorganisms for the tiered exemptions. Novozymes’ letter was submitted in 1997 supporting the inclusion of B. amyloliquefaciens, and Genencor’s letter was submitted in 2005 in support of T. reesei. Upon EPA’s review of these petitions, the agency made a preliminary determination that the information presented was sufficient to support a finding that the requested actions would not present an unreasonable risk of injury to health or the environment. However, in developing its Proposed Rule, EPA decided to somewhat narrow the scope of the exemption. For B. amyloliquefaciens, the exemption would only cover Bacillus amyloliquefaciens subsp. amyloliquefaciens, a subspecies said to encompass essentially all strains that are commonly used industrially. For T. reesei, the exemption would only cover Trichoderma reesei strain QM6a and moreover would apply only if the organism were “used only in submerged standard industrial fermentation operations in which no solid plant material or insoluble substrate is present in the fermentation broth,” and where the fermentation is initiated after specified inactivation procedures have taken place. This usage limitation for T. reesei arises from a concern over a potentially toxic secondary metabolite that has been found to arise when this organism is grown in certain non-standard conditions – this will be described in more detail below. The September 5 Federal Register notice set a 60-day comment period which expired on November 5, 2012. Under federal rulemaking procedures, EPA must consider any public comments it received during that period and take these into account when publishing a Final Rule. It is not known when EPA might propose a Final Rule, but generally speaking, any final rule would probably take effect 30 or 60 days after its publication in the Federal Register. Without taking any position on the scientific merits of the proposed revision to the rule, I would simply observe that these are indeed well-characterized microbial species that have been extensively and commonly used in industry for many years. In fact, the idea that these species should be added to the exemption list has been kicking around for some time, as can be seen by the early dates of the Genencor and Novozymes petitions. This seems to me to be a sensible revision to the rule, which would allow the manufacturers of industrial enzymes for many purposes, including biofuel production, to move forward to commercialize new and improved production strains without the need for MCAN filings. The only health concern associated with T. reesei QM6a is its ability to produce a secondary metabolite called paracelsin, which is a peptaibol. Peptaibols are small linear peptides of 1,000-2,000 daltons characterized by a high content of the non-proteinogenic amino acid [alpha]-amino-isobutyric acid (Aib), with an N-terminus that is typically acetylated, and a C-terminus that is linked to an amino alcohol. … Paracelsin has been shown to have toxicity toward mammalian cells such as hemolytic activity on human erythrocytes and cytotoxicity to rat adrenal medulla PC12 cells. Paracelsin has not been detected in the use of T. reesei QM6a under submerged standard industrial fermentation operations in which no solid plant material or insoluble substrate is present in the fermentation broth; numerous toxicity studies on enzyme products of T. reesei QM6a have demonstrated a lack of toxicity to laboratory animals. EPA therefore generally expects that paracelsin production will be of insignificant concern with submerged standard industrial fermentation operations in which no solid plant material or insoluble substrate is present in the fermentation broth. … However, under non-standard conditions of fermentation, such as with extended duration of fermentation, or fermentation in the presence of insoluble carbon sources such as cellulose or in the presence of solid plant material, paracelsin may be produced. It was this concern that led EPA to limit the uses of T. reesei eligible for the tiered exemptions to those taking place in “submerged standard industrial fermentations”. However, this concern also led EPA to take an unusual action with regard to the Danisco MCAN under which the concern was raised. Section 5(a)(2) of TSCA authorizes EPA to determine that a proposed use of a chemical substance is a “significant new use,” a determination EPA must make after considering all relevant health and safety factors, and it generally must formalize this determination through the federal rule-making process. The TSCA biotechnology regulations are based on the premise that EPA can regulate new microorganisms as “new chemicals”, and so it interprets this provision of TSCA to give it the authority to issue Significant New Use Rules (SNURs) for uses of microorganisms that it judges to pose potential risks when used in certain processes or other circumstances. Subpart L of the biotechnology rules in 40 CFR Part 725, specifically §725.980, governs how EPA may issue a SNUR for a new microorganism covered by an MCAN. During review of the specific T. reesei, modified as described in MCAN J-10-2, EPA determined that certain fermentation conditions, other than the typical submerged standard industrial fermentation process for enzyme production described [above], could result in increased exposures thereby constituting a “significant new use.” Specifically, EPA is concerned that where growth on solid plant material or insoluble substrate occurs, T. reesei has been shown to produce a secondary metabolite known as paracelsin, which is associated with a variety of toxic effects to mammalian and bacterial cells. Use of the MCAN microorganism without the specific containment or inactivation controls listed in the MCAN, described [above], may result in adverse human health and environmental effects. Sec. 725.1077 Trichoderma reesei (generic). (a) Microorganism and significant new uses subject to reporting. (1) The genetically modified microorganism identified generically as Trichoderma reesei (MCAN J-10-2) is subject to reporting under this section for the significant new uses described in paragraph (a)(2) of this section. (A) Submerged fermentation (i.e., growth of the microorganism occurs beneath the surface of the liquid growth medium). (B) No solid plant material or insoluble substrate is included with the microorganism for fermentation. (C) Any fermentation of solid plant material or insoluble substrate, to which fermentation broth is added, is initiated only after the inactivation of the microorganism as delineated in 40 CFR 725.422(d). Once this rule is finalized, it means that any entity wishing to use T. reesei under the “new use” conditions specified in the rule must first file a Significant New Use Notice (SNUN) with EPA. A SNUN is equivalent to an MCAN (or, for chemical substances, a Premanufacture Notice), and it would allow EPA to review the health and safety implications of the proposed use of the organism under those conditions. In the absence of EPA review of a SNUN, no entity would be allowed to use T. reesei under these conditions. The Federal Register notice created a brief, one-month, public comment period that expired on July 13, 2012. The status of this proposed rule, and the timing of its possible finalization, are not known. However, this action is noteworthy in that it appears to be the first time EPA has used the “SNUR” process for a microorganism that it reviewed under an MCAN, and it establishes a precedent that EPA may use in the future should analogous situations arise. D. Glass Associates, Inc. is a consulting company specializing in government and regulatory support for renewable fuels and industrial biotechnology. David Glass, Ph.D. is a veteran of over thirty years in the biotechnology industry, with expertise in industrial biotechnology regulatory affairs, U.S. and international renewable fuels regulation, patents, technology licensing, and market and technology assessments. Dr. Glass also serves as director of regulatory affairs for Joule Unlimited Technologies, Inc. More information on D. Glass Associates’ regulatory affairs consulting capabilities, and copies of some of Dr. Glass’s prior presentations on biofuels and biotechnology regulation, are available at www.slideshare.net/djglass99 and at www.dglassassociates.com. The views expressed in this blog are those of Dr. Glass and D. Glass Associates and do not represent the views of Joule Unlimited Technologies, Inc. or any other organization with which Dr. Glass is affiliated. Please visit our other blog, Biofuel Policy Watch. Aside from the U.S. Renewable Fuel Standard (RFS), which I’ve described in several previous blog posts starting here, another important government program elsewhere in the world to promote renewable fuels is the Renewable Energy Directive (RED) of the European Union. The RED, adopted in 2009, was put in place to ensure that all the 27 member states of the European Union achieve specified targets for use of renewable fuels and reduction of greenhouse gas (GHG) emissions across all energy sectors, with specific requirements for the subset of fuels used for transportation. A companion directive, the Fuel Quality Directive (FQD), has additional, complementary requirements for GHG reductions within the transport sector. These directives place certain obligations on EU member states, but also create certain requirements with which developers or producers of renewable fuels must comply in order for their fuels to qualify as “renewable” under the regulations. In this blog post, I’ll describe these EU directives and their implications for biofuel companies. In a companion post on Biofuel Policy Watch, I’ll discuss a recently proposed revision to the RED and FQD that has generated substantial controversy within the fuels community. Derive 20% of overall energy consumption, across all sectors, from renewable sources by 2020. Derive 10% of energy consumption within the transport sector from renewable sources by 2020. Achieve greenhouse gas emission reductions of at least 35%, relative to fossil fuels, by mid-2010, with this target rising to 50% in 2017 and 60% in 2018, for fuels produced in 2017 or later. However, fuel production plants that were in operation as of January 2008 had until April 2013 to meet the 35% GHG reduction requirement. The Renewable Energy Directive is implemented by the European Commission Directorate General for Energy (DG Energy). As noted above, member states were required to adopt national legislation to reflect the requirements and standards set forth in the Directive. Although many countries did not meet the specified deadline of June 2010 to adopt such laws, I think that, as of this writing, most of the major EU states have complied. The June 2012 report from USDA’s Global Agricultural Information Network said that, as of that month, 20 of the 27 member states had adopted national laws to fully implement the RED while the other 7 had partially complied. A good resource for tracking EU member state compliance with both the RED and the FQD can be found here. The Fuel Quality Directive (FQD), formally known as Directive 2009/30/EC of the European Parliament and of the Council, and which amended Directive 98/70/EC, was also adopted on April 23, 2009. It establishes the specifications (standards) for transportation fuels to be used across the EU. The Directive also requires that all fuel suppliers (e.g. oil companies) must meet a 6% reduction of GHG emissions by 2020, relative to 2010 baseline levels, across all fuel categories. This reduction in emissions could be achieved using any low-carbon fuel options, such as hydrogen or electricity, but it is generally expected that the use of biofuels will account for most of the targeted reductions. The target of 6% is designed to be consistent with the use of 10% biofuel with an average 60% carbon saving to comply with the Renewable Energy Directive, as described above. The FQD also establishes that ethanol may be blended into gasoline (petrol) up to a limit of 10% v/v, although this is subject to national laws in the member states. Although the obligations in the Directives to meet the specified targets are placed on national governments, these obligations are passed down to the entities that sell fuel to the public, as well as the companies that manufacture or import fuels for eventual sale in the EU. Specifically, there are defined requirements that a fuel and its production pathway must meet in order for the fuel to be considered a “renewable fuel” that qualifies to count towards fulfillment of the targets set in the Directives. Just as the U.S. Renewable Fuel Standard defines renewable fuels as those derived from “renewable biomass”, the RED specifies that “renewable fuels” are not to be produced from raw materials obtained from land having a “high biodiversity status” or “high carbon content”. These terms are defined in the Directive (see also the BioEnergy Wiki page for a useful summary). In addition, if agricultural crops are used to produce the fuel, they must be grown in compliance with EU environmental regulations governing agriculture. Furthermore, in order for a fuel to be considered as “renewable”, it must show a reduction in GHG emissions over the lifecycle of its production, such that the carbon intensity of the fuel is known and can be applied towards the national targets. (When used in the context of regulations such as the RED, “carbon intensity” is defined as the net mass of carbon dioxide gas or its equivalent that is released over the life cycle of the fuel, taking into account the energy and materials needed to produce the fuel). The European Commission calculated default carbon intensities for a number of specific biofuel production pathways, which can be found in Annex V of the RED, and these can be used in reporting by regulated entities without providing any additional information to any national government. However, for fuel production pathways not included within this list, carbon intensities must be calculated using acceptable methods for developing life cycle analyses (LCAs). More importantly, renewable fuels must be produced sustainably: that is, in order for a fuel to be considered as “renewable” under the RED, it must be analyzed and certified to be in compliance with sustainability criteria established in the Directive. The required sustainability analysis incorporates, but goes well beyond, considerations addressed in typical LCAs. There are twelve different factors which must be considered in these analyses, including Local Food Security, Human and Labor Rights, Rural and Social Development, and others including lifecycle GHG emissions. The requirements to conduct these analyses are quite complicated, and for this reason the EU has established a requirement that any proposed scheme or methodology for conducting sustainability analyses under the RED must be certified by the EU before any fuel provider can rely on such a scheme to establish its eligibility. As of this writing, there are 13 such schemes that have been approved, which are listed here. Several of these are specific to certain feedstocks, such as sugarcane or palm oil, while others are more general. Perhaps the best known general scheme is that of the Roundtable on Sustainable Biofuels. Fuel producers can conduct these analyses themselves, or have them done by third parties, but in either case the regulations require that the analysis be verified by competent, independent auditors that follow international standards. Agro2 S.A., located in Veraguas, Panama, says it is the first company in Panama to be certified under the EU’s Renewable Energy Directive by the International Sustainability and Carbon Certification. This certification confirms the compliance of Agro2’s production and processing of ethanol using a cassava feedstock with the sustainability criteria set out in the EU RED. Argos Oil has become the first European company to introduce sustainable certified sugarcane ethanol into the European market. The certification was granted by Bonsucro, one of the international organizations whose sustainability criteria meet the requirements of the EU Renewable Fuels Directive. The Solaridad network, a specialized organization for sustainable development, assisted in obtaining this certification. The adoption of the RED seems to have stimulated the growth of the biofuel industry in Europe, although it seems likely that biofuel use is not growing as rapidly as might be needed to meet the directive’s goals for later this decade. Although the comprehensive sustainability analysis required under the directive would seem to be a deterrent for companies wishing to enter the EU market with renewable fuels, there is ample evidence that many companies, large and small, have taken the steps to have their products certified under one of the approved schemes mentioned above. On October 17, 2012, the European Commission proposed a revision to the RED and the FQD that embodies some substantial changes to the EU’s approach to certain biofuels, specifically in proposing to institute incentives for the use of second generation biofuels that are not derived from food crops. This proposal, which has generated significant controversy both within the industry and also from other interested parties, is discussed in a posting on my Biofuel Policy Watch blog. It will be interesting to see how the amended directive, if adopted, affects the future development of the biofuels industry and markets in Europe. The previous blog entries have described the U.S. Renewable Fuel Standard (RFS), its importance for the biofuels industry, and some of the policy debates and controversies that have arisen regarding its implementation. As discussed in the initial entry, the original legislative language of the Energy Independence and Security Act (EISA) of 2007, in setting up the “RFS2” program, established four categories of renewable fuels, and in EPA’s implementing regulations under this law, the agency specified that certain fuels and feedstock “pathways” qualified for inclusion within these categories. However, fuel pathways not included within the original regulations must be reviewed and approved by EPA to be considered as renewable fuels under the RFS. In this entry, I’ll briefly describe the petition process by which companies can propose that their fuel pathways be covered under the RFS, and how EPA makes these determinations. 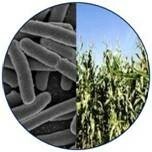 EPA’s regulations implementing the RFS can be found at 40 CFR Part 80. The portion of the regulations which lists all the approved fuels and pathways, and the information needed to generate Renewable Identification Numbers (RINs) for each fuel, is found in Part 80.1426 and is called “Table 1 To § 80.1426—Applicable D Codes for Each Fuel Pathway for Use in Generating RINs.” This table, which can be found here, lists for each applicable fuel, the fuel type (e.g. diesel, ethanol, etc. ), the feedstock from which it is produced (e.g. corn starch, soybean oil, etc. ), production process requirements (if any), and also the “D Code” which identifies the type of fuel in the RINs that each producer is entitled to generate. From time to time, after undergoing a formal rulemaking process, EPA may add generic pathways to this Table. The most recent is the decision that certain processes using grain sorghum to produce ethanol qualified either as an “advanced biofuel” or a “renewable fuel” under the regulations. EPA created a process by which producers of renewable fuels can apply to have new pathways certified. This is done by the filing of petitions with the EPA Office of Transportation and Air Quality. Instructions and guidance for filing these petitions are available on EPA’s website. EPA uses these petitions to determine whether or not the fuel is produced from feedstock(s) that qualify as “renewable” under the law’s definitions, and whether production of the fuel will meet the applicable threshold levels of greenhouse gas (GHG) emission reductions (20% for “renewable fuels”, 50% for “advanced biofuels” or “renewable biodiesel”, or 60% for “cellulosic biofuels”). EPA does this by conducting its own Life Cycle Analysis (LCA), using its preferred mathematical modeling based on information supplied by the applicant. Certain basic identifying information about the company and its facilities, as specified in 40 CFR §80.76. A technical justification for inclusion of the pathway, that includes a description of the renewable fuel, the feedstock(s) used to make it, and the production process. This section of the petition must include process modeling flow charts. A description of the significant differences between fuel production processes already evaluated in the RFS2 rule and the petitioned fuel pathway, and any other relevant information. The estimated mass balance for the pathway, including feedstocks, fuels produced, co-products and waste materials production. Information on any co-products that are anticipated to arise from the process, including their expected use and market value. An energy balance for the pathway, including a list of any energy and process heat inputs and outputs used in the pathway, including such sources produced off site or by another entity. This should include fuels used by type, including purchased electricity and the source and fuel required for any steam or hot water purchased for the fuel production process. In addition, the energy output information should include energy content (with heating value specified) of the fuel product produced and any co-products produced. The extent to which excess electricity is generated and distributed outside the production facility should be described. Any other relevant information pertaining to energy saving technologies or other process improvements. EPA also asks that petition demonstrate the technical and commercial feasibility of the proposed pathway. The website suggests that, to do this, petitions could include copies of applications for air or construction permits, copies of blueprints of the facility, or photographs of the facility or a pilot plant. This information will help EPA prioritize action on the petition, since it is EPA’s intent to address on a priority basis petitions for products that are closest to actual production. In addition, if the process makes use of a feedstock which EPA has not previously reviewed or modeled, the following information is needed. The type of feedstock and description of how it meets the definition of renewable biomass at §80.1401. Market value of the feedstock, including market data such as current and projected commodity prices, if applicable. List of other uses for the feedstock, e.g. information on current and projected domestic and international uses and possible international exports. List of chemical inputs needed to produce the renewable biomass source of the feedstock and to prepare the renewable biomass for processing into feedstock, such as fertilizer, pesticides, etc. . The type and amount of energy needed to obtain the feedstock and deliver it to the facility, including, if applicable, the energy needed to plant and harvest the renewable biomass and/or modify the source to create the feedstock. Current and projected yields of the feedstock that will be used to produce the fuels. Any anticipated changes in feedstock and fuel production yields over time. To date, EPA has not provided any template or any further guidance for how petitions should be structured, so that applicants have a fair amount of leeway in how to provide the requested information and its supporting documentation. EPA has developed Excel spreadsheets which applicants are requested to use to report to the mass balance and energy balance information for the petition, as well as certain information about the source and production of the renewable feedstock. As is always the case in regulatory interactions, it is advisable to have presubmission meetings with agency staff to help in the preparation of petitions and the information that is needed to be included. In my experience in working with EPA to develop a petition under the RFS, I found agency staff to be extremely helpful and cooperative in guiding the petition process. In fact, you may find the agency to be quite flexible on the structure and content of the formal petition, provided that the essential information on mass and energy balance is provided. In other words, there is no “right” or “wrong” format for a new fuel pathway petition, as long as the key information is provided. As of this writing, EPA has approved the following seven petitions for certifications of additional pathways. *I’ve shortened some of these feedstock descriptions, so please note that many of these processes are approved for a broader range of feedstocks than what is listed. Additional information can be found in EPA’s decision letters for these actions, which can be found at the links in the table and on the EPA website. As of this writing, there are at least 34 additional pathways now being reviewed by EPA. The complete list can be found here. The time required by EPA to review and approve pathways seems to be variable and somewhat hard to predict, and also depends on the novelty of the process. Where a pathway is similar to an existing pathway, EPA can issue a simple letter determination. This is how EPA has approved the 7 pathways noted above, and historically this has taken perhaps 9-12 months from the time of initial submission to the time of approval. Many industry officials have lately observed that the large backlog of petitions at the EPA is leading to extremely long review and approval times for new pathway petitions. Pathways that utilize new feedstocks or processes not previously modeled by EPA generally require a more lengthy notice-and-comment rulemaking. This requires advance public comment likely would require a longer period of time. Pathways approved in this way would be added to Table 1 of Section 1416, as described above. Overall, my experience with the RFS program is that EPA staff are available and interested to help potential applicants navigate the process. The staff can be flexible on the structure of new pathway petitions, and can be very helpful in identifying the information that is most needed, as well as the information which is less critical even if required by the regulations. Many have observed that industry and EPA share a common interest in seeing as many fuel pathways added to, or acknowledged under, the RFS as legitimately possible, to make it easier for the yearly fuel volume obligations to be met. As long as a proposed pathway can be shown to utilize an appropriate renewable feedstock and to meet the specified GHG emission reductions, EPA staff should be very willing to assist companies provide the information needed to successfully gain the pathway’s approval. Just a quick note to mention that I’ve just posted the first of what I expect will be a series of news updates on my Biofuel Policy Watch blog. Today’s posting reports on news items and other developments during the last few months of 2012 and early 2013 that are relevant to the use and market acceptance of E15 ethanol and other higher blends of ethanol such as E85. This includes updates of legislative and regulatory developments at the federal and state levels, and other developments in the states promoting or otherwise affecting market acceptance of these ethanol blends. Increased consumer use of such blends, E15 in particular, is viewed as a critical step for the ethanol and renewable fuels industry to overcome the ethanol “blend wall” so that sufficient volumes of ethanol are sold in the U.S. to meet RFS volume mandates in the coming years. You can access this update here. D. Glass Associates, Inc. is a consulting company specializing in government and regulatory support for renewable fuels and industrial biotechnology. David Glass, Ph.D. is a veteran of over thirty years in the biotechnology industry, with expertise in industrial biotechnology regulatory affairs, U.S. and international renewable fuels regulation, patents, technology licensing, and market and technology assessments. Dr. Glass also serves as director of regulatory affairs for Joule Unlimited Technologies, Inc. More information on D. Glass Associates’ government and regulatory consulting capabilities, and copies of some of Dr. Glass’s prior presentations on biofuels and biotechnology regulation, are available at www.slideshare.net/djglass99 and at www.dglassassociates.com. The views expressed in this blog are those of Dr. Glass and D. Glass Associates and do not represent the views of Joule Unlimited Technologies, Inc. or any other organization with which Dr. Glass is affiliated. Please visit our other blog, Biofuel Policy Watch. Although the renewable fuels industry and its supporters credit the U.S. Renewable Fuel Standard (RFS) with stimulating the growth of the industry and with exponentially increasing the production of renewable fuels, the RFS is (and perhaps always been) controversial. The preferences the law created for non-fossil fuels naturally placed it in opposition to entrenched economic interests of the oil and gas industry, differences which have increasingly come to the fore as the RFS mandates have grown and the difficulties in meeting the mandated volumes have increased. These controversies have played out in the forum of public discussion, as well as Congress, the courts, and agency administrative proceedings. The following is a summary of the major areas of dispute that have arisen: you can find a more complete discussion of these issues in a two-part posting on my Biofuel Policy Watch blog. Impacts of the 2012 U.S. drought on the corn ethanol mandates. As the U.S. drought intensified in the summer and autumn of 2012, numerous trade groups, NGOs and other organizations called for EPA to lower or waive the mandated volumes for corn ethanol for 2012 and 2013, out of a belief that the diversion of much of the nation’s corn crop to ethanol production will lead to higher food prices. In response, EPA opened a public comment period on whether it should waive or reduce the corn-starch ethanol mandate under the RFS. On November 16, 2012, EPA announced that it had denied the petitions to waive the 2012 or 2013 volume mandates under the RFS, however most observers expect this issue will not go away, as attention continues to be directed to “food vs. fuel” issues in biofuel production. Challenges to the cellulosic fuel mandates. Delays in commercial development of cellulosic ethanol have left the industry far short of meeting the aggressive volume mandates for cellulosic fuels that were established under the RFS. In fact, prior to 2012 there were no fuels produced in the U.S. that qualified as cellulosic biofuels under the RFS. Although EPA has continually relaxed the cellulosic requirements on a year-to-year basis, there have been repeated calls for EPA to abolish or reduce the amounts of cellulosic fuel required under the RFS. This issue remains active: although EPA has denied petitions to remove the cellulosic mandates and has also scored some court victories, there are still active lawsuits pending and the continuing threat of Congressional action aimed at eliminating these volume mandates. The problem of fraudulent RINs. Another concern arose during 2012, upon the discovery that a small number of companies had been selling fraudulent (i.e. nonexistent) Renewable Identification Numbers (RINs), the unique identifiers attached to volumes of fuel qualifying as “renewable” under the RFS. These companies pocketed large payments from fuel blenders and suppliers for the nonexistent RINs, who then found themselves out of compliance with the RFS and subject to penalties for failing to produce or purchase sufficient RINs to meet their volume obligations. This attracted a good deal of media attention and has introduced considerable uncertainty into the RIN market. In October 2012, EPA published a notice outlining the elements for a Draft Quality Assurance Plan which they intend to be the centerpiece of a proposed regulation to address fraudulent RINs. The EPA notice contemplated that the agency would propose a rule that established standards under which third parties could set up programs for independent verification and validation of RINs. A number of entities have already begun setting up such independent third-party validation programs. Challenges to the Entire RFS. There continues to be opposition to the overall RFS legislation, with frequent calls for its repeal or overhaul. For example, the American Petroleum Institute has recently adopted a policy favoring outright repeal of the RFS “because it is not working well and because it will force higher concentrations of ethanol in gasoline that could harm vehicles.” Possible legislative challenges are expected in the new Congressional session. In response to these threats, a group of industry groups and other stakeholders have formed a coalition called FuelsAmerica, with the mission of aggressively publicizing the benefits of the RFS. This is the first of several blog entries where I’ll describe the U.S. Renewable Fuel Standard (RFS), how the program works, its importance to the biofuels industry, and the significant ongoing debates and controversies it has engendered. (In these entries, I’ll use the terms “biofuels” and “renewable fuels” somewhat interchangeably, although the latter term also includes a broader range of fuels, including those produced by physical or chemical processes, that meet the definitions in the law). The RFS is a nationwide program, first enacted in 2005 (amended in 2007) to require increasing use of renewable fuels by 2022. The RFS is administered by the U.S. EPA under statutory authority of the Energy Policy Act of 2005, as amended by the Energy Independence and Security Act (EISA) of 2007 (because of this amended legislative authority, the current version of the law is sometimes referred to as RFS2). EPA has issued regulations to implement this law, which can be found at 40 CFR Part 80 (first published in the March 26, 2010 Federal Register). The goal of the RFS is to directly support U.S. renewable fuels production by providing a mandatory market for qualifying fuels—fuel blenders must incorporate minimum volumes of renewable fuels in their annual transportation fuel sales. By guaranteeing a market for biofuels that is largely independent of pricing and fuel costs, RFS2 was intended to reduce the risk associated with biofuels production, and to provide an indirect subsidy for capital investment in the construction of biofuels plants. RFS2 establishes four categories of renewable fuels and sets yearly minimum volumes for each category. Certain fuels were placed into specific categories, while fuels produced through production pathways not specified in the original law or regulations will generally need to go through a petition process in order to be qualified into one of the four categories. I’ll discuss the approved pathways and discuss how the petition process works in a subsequent blog entry. Producers of fuels qualifying for any of the four categories can issue Renewable Identification Numbers (RINs) for the fuels they produce. RINs are tradable on open markets and thus provide tangible economic value to fuel manufacturers. “Renewable fuels”, the broadest category, requires the fuel to be produced from a renewable feedstock and to reduce GHG emissions by at least 20%. Corn-starch ethanol falls into this category. “Advanced biofuels” is a subset of “renewable fuels”, where the GHG emission reduction must be at least 50%, but where corn-starch ethanol is explicitly excluded. The most common fuel falling into this category is ethanol produced from sugar cane. “Cellulosic biofuel” must be produced from a cellulosic feedstock and reduce GHG emissions by at least 60%. The fourth category is “biomass-based biodiesel” which includes diesel fuel made from any renewable feedstock where the GHG reductions are at least 50%. (Note that the regulation includes several definitions important for determining which fuels and feedstocks qualify – the most important of these is the definition of “renewable biomass”, since all “renewable fuels” must be derived from feedstocks qualifying as renewable biomass). The regulations assumed that certain fuels, known and assessed during promulgation of the regulations, would meet the specified GHG reduction levels, but fuels produced by new pathways would need to establish their GHG reduction levels through life cycle assessments (LCAs) conducted by EPA based on data provided by the company proposing the fuel. I’ll describe the petition process for establishment of new fuel pathways in a subsequent post. The figure below summarizes the annual volume obligations under the RFS. The 2011 volume mandate under the RFS was 12.6 billion gallons of corn starch-derived ethanol, and about 1.5 billion gallons of ethanol or other biofuels derived from sources other than corn starch. 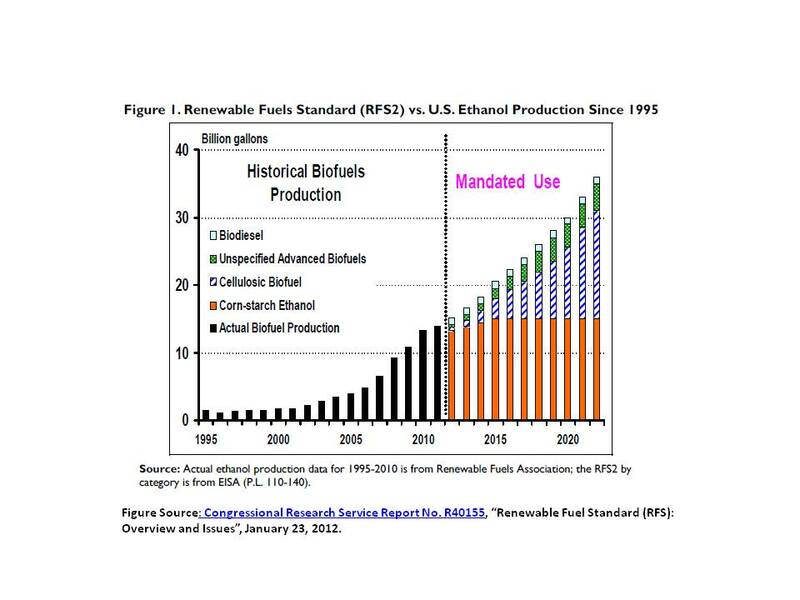 The 2012 mandate was 13.2 billion gallons of corn starch ethanol and 2 billion of other biofuels. The corn-starch ethanol mandate will level out at 15 billion in a few years while the non-corn-starch mandates will increase year-by-year (e.g. 2 billion gallons in 2012, 2.75 billion in 2013, etc.). The latter mandates will need to be met by a combination of cellulosic ethanol, photosynthetic ethanol, butanol, biodiesel, algal diesel, and other advanced biofuels. However, delays in commercial development of cellulosic ethanol, unforeseen in 2007 prior to the economic downturn which began in 2008, have left the industry far short of meeting the aggressive volume mandates for cellulosic fuels (in fact, prior to 2012 there were no fuels produced in the U.S. that qualified as cellulosic biofuels under the RFS), and so EPA has continually downgraded the mandated levels for cellulosic biofuels on a year-by-year basis. In addition, the law requires EPA to establish the mandates for biodiesel on an annual basis via the rulemaking process. In September 2012, EPA issued its final rule establishing the 2013 biodiesel mandate at 1.28 billion gallons, up from 1.0 billion for 2011. This level had previously been announced in a proposed rule, and is already reflected in the figure. The yearly minimum volume mandates for the individual fuel categories are passed along to “obligated parties” (i.e., sellers or blenders of fuels) on a pro-rated basis dependent upon each party’s sales of fuel, (described below) and parties that fail to meet their “renewable volume obligation” (RVO) are subject to penalties. In spite of EPA’s ability, in some cases, to revise the minimum volumes on an annual basis, critics have increasingly attacked the RFS in recent years. Some critics feel that, even with EPA’s annual revisions, the cellulosic volume mandates remain too high, since no commercial cellulosic fuels have yet been available; and further criticism has come due to the impact of the 2012 U.S. drought on corn availability and prices. These concerns have led to court challenges, formal petitions to EPA, and considerable public debate. I’ll describe these ongoing controversies in a later blog entry. Compliance with the RFS by fuel producers and sellers is tracked using a system wherein each gallon of fuel that qualifies as a renewable fuel is assigned a unique identification number. This number is called a Renewable Identification Number (RIN), and it is generated by the company that manufactures or imports the fuel. Each RIN is a unique 38-character number that follows a format specified in the regulations. The 38 characters include several different sections (blocks of characters) which are used to designate different characteristics of the fuel, including the renewable fuel category, the year the fuel is produced, a unique ID for the company generating the RIN, the company’s batch number, etc. Each gallon of fuel within a batch is assigned its own RIN. When a company creates RINs, they must be reported to EPA, generally on a quarterly basis. When the producer sells the fuel to another party such as a blender or distributer, the RINs are also transferred along with the fuel, although when the fuel is blended for retail sale or readied for export, the RINs are considered to be “separated” from the fuel, and at this point the RIN gains economic value on the open market. Companies that produce fuels qualifying as “renewable” under the RFS (whether fuels initially covered in the regulation or ones added at a later date following approval of a petition) must register with EPA. The registration process includes a third party engineering review of the company’s facility(ies) to ensure that the manufacturing process is in compliance with the regulations and is expected to yield the required reductions of greenhouse gas emissions. Each fuel producer has reporting requirements to EPA as well. The yearly mandates are passed down to entities that are known as “Obligated Parties”. Obligated parties are defined as the refiners that produce gasoline or diesel, along with companies that import gasoline or diesel, only in the lower 48 states and Hawaii (i.e., excluding Alaska and the territories). Each year, EPA determines how much renewable fuel each obligated party is required to sell in order for the overall RFS volume mandates to be met. This is essentially done by pro-rating to determine what percentage of an obligated party’s total fuel sales for the year must consist of RINs for qualified renewable fuels. To do this, EPA estimates the total volume of transportation fuels projected to be used in the coming year, and then calculates the percentage of that total that must be met by each of the four categories of renewable fuel in order for total fuel sales to achieve the volume mandates. EPA then applies these percentages to each obligated party, requiring each party to own RINs accounting for these percentages of each of the four fuel types. The resulting volumes are called renewable volume obligations (RVOs). Each provider can acquire these RINs either by producing biofuels itself or by purchasing RINs on the open market. Because most obligated parties are not biofuel producers, they would be expected to meet their obligation through the purchase of RINs. Some of the required RINs would be acquired with the purchase of fuels (since RINs travel with fuels), but others would be acquired on the open market. RINs are traded on the open market, but price fluctuations are common. RINs commanding the highest price are those for fuel categories associated with the highest levels of GHG emission reductions, such as cellulosic RINs, while the lowest price RINs are for the “renewable fuel” category under the RFS, which includes fuels with less favorable GHG emission reductions such as corn starch ethanol. By way of example, the value of a Renewable Fuel RIN for ethanol in early December 2012 was only about $0.05 per gallon and earlier in 2012 the price was as low as $0.0185/gallon. In contrast, the price of a RIN for an “advanced biofuel”, currently met largely by Brazilian sugarcane ethanol, is higher – these RINs were valued at about $0.45-0.50 per gallon in December 2012 but were priced at $0.70-0.80 per gallon earlier in 2012. Biodiesel RIN prices have probably been more stable, and were in the range of $0.50-0.55 per gallon in December. Cellulosic RINs are currently the most valuable, due to the scarcity of cellulosic fuels that qualify under the RFS: RINs for cellulosic fuel produced in 2011 were priced at $1.14 per gallon in December, and 2012 cellulosic RINs were priced at $0.79 per gallon. In the years since it first went into effect, the RFS is credited by most observers with providing a useful and needed stimulus for the biofuel and renewable fuels industry. However, the law has not been popular with everyone, and has engendered significant controversies, particularly in recent years. Many observers expect the RFS to come under increased Congressional scrutiny and attack in 2013, with many calling for its outright repeal. I’ll discuss these controversies and public policy debates in the next entry of the blog.